At least six have been killed and the fate of over 280, many of whom high school students, remains unknown after a ferry capsized and sank off South Korean coast. A rescue operation is under way amid fears the death toll is likely to rise. Coastguard officials said that 175 have been rescued; at least 55 were injured. Meanwhile, 281 remained unaccounted for as frantic rescue operation continued late into the night with the involvement of dozens of ships and helicopters. One Russian citizen, 17-year-old Vyacheslav Serkov, is among those missing, the Foreign Ministry said. Six people have been confirmed dead so far, according to The Korea Herald. Among them, a 27-year old woman, a staff worker for the ferry company, and three students from Danwon High School in the city of Ansan, not far from the capital Seoul. No detailed information was given about two other victims of the accident. As it got darker, divers had to suspend their works until the dawn (2300 GMT) due to poor visibility – only 20 centimeters – and the strong current in the area of the sinking, RIA Novosti reported. Divers resumed their search on Thursday, while there was a report that several people may have survived the ferry's sinking in an air pocket. Conflicting information arose after a Reuters story stating that the father of a missing child aboard the ferry had received a text message from his son was withdrawn. The deadly accident occurred Wednesday morning as the South Korean Sewol ferry carrying 462 passengers and crew was on an overnight trip from the northwestern port of Incheon to the southern resort island of Jeju. Many of the voyagers were students and teachers from the same high school. The reasons behind the tragedy were not immediately clear, as weather conditions off South Korea’s southwest cost were apparently calm. The Ministry of Oceans and Fisheries said that minutes before the tragedy, the Sewol began to drift in an unexpected direction. Some survivors also said that they heard a loud noise before the vessel leaned heavily on to its side and capsized. “It was fine. 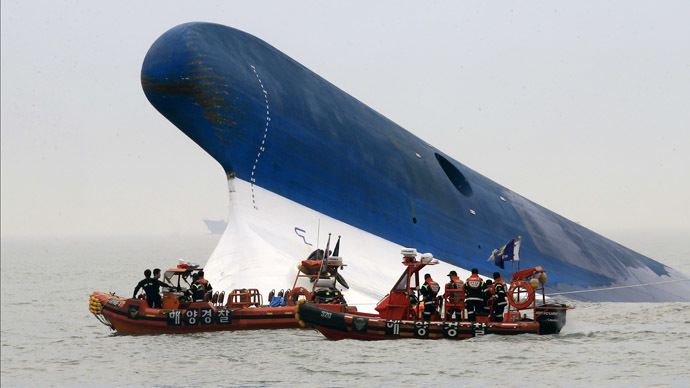 Then the ship went 'boom' and there was a noise of cargo falling,” said Cha Eun-ok, who was on the deck of the ferry taking photos at the time, Reuters reported. “The onboard announcement told people to stay put ... people who stayed are trapped,” she said in Jindo, the nearest town to the scene of the tragedy. Another survivor, student Lim Hyung-min, said that he and other teenagers jumped into the ocean wearing life jackets and then swam to a nearby rescue boat, The Associated Press reported, citing YTN. “As the ferry was shaking and tilting, we all tripped and bumped into each another,” Lim said, adding that some people were bleeding. The ocean "was so cold. ... I was hurrying, thinking that I wanted to live,” the student added. 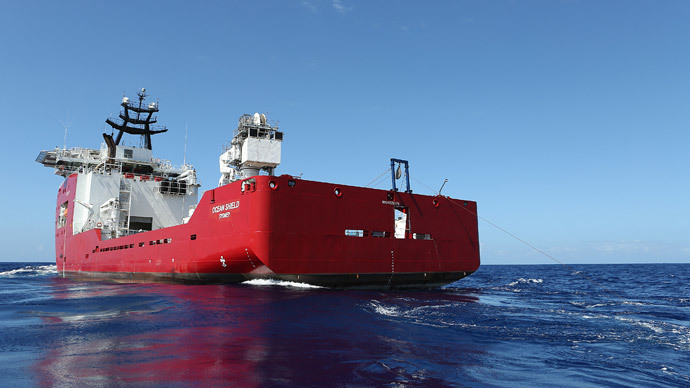 The coastguard said once they received a distress signal from the ferry early Wednesday, a rescue operation was launched involving almost 100 coastguard ships, navy vessels and fishing boats, as well as 18 helicopters. South Korean TV stations were showing live pictures of the ship slowly sinking as passengers jumped out or were winched up by helicopters. Rescuers climbed over the sides of the ferry pulling out passengers, but then it overturned completely, slowly continuing to sink. 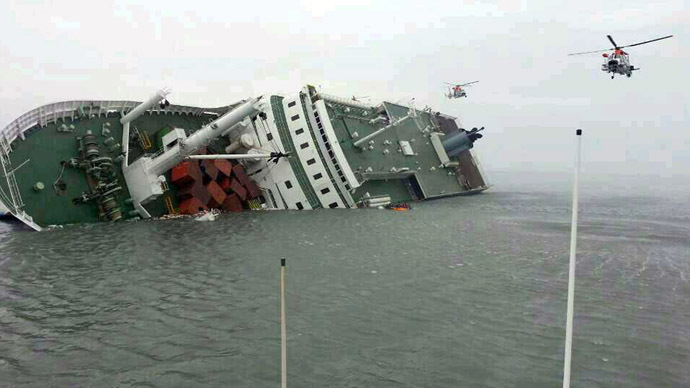 A coastguard official in Jindo said that the waters where accident occurred have some of the strongest tides off South Korea's coastline. Because of that, divers could not entering the mostly submerged ship for several hours. "We cannot give up," said South Korean President Park Geun-hye, AP cited. "We have to do our best to rescue even one passenger." Those rescued were taken to nearby Jindo Island, where they got medical aid, and wrapped in blankets were huddled on the floor of a gymnasium.